← The Difference One Player Can Make at Arsenal. This Guy. Is Rob Holding the New Gilberto? THE SEASON, TACTICS, PHILOSOPHY AND SUMMER RUMBLINGS (PART 2). For so long we have been cruising the brightly lit highways of Champions League football but now comes the time to truck the tougher terrains of the Europa League. More games, more congestion in the schedule, but also more obscure and distant parts of Europe. There will be less fanfare, less revenue, and, perhaps a toxic hangover from the season just ended. In a stiffer summer window, we must come out with a deeper squad. Yes, a deeper squad. For while the demands of Europa League football impose the need for a bigger squad, the contest for Premier League glory cries out for a more competitive one. Nine wins in 10 since we switched to the 3:4:3 formation says that we have–and always have had–a good team. But we dare not rest on our oars. Even if our late-in-the-day discovered good form was able to get those results, every team is strengthening and we have to do likewise. With the resources available to them, the top 6 teams of the 16/17 season can end up rearranged in any sequence by the end of 17/18 season, and, of course, we desire a sequence that would find us at the top. We must battle to hold players in the squad while fetching new ones that would make us better. Otherwise, it could get damn ugly with the fans even before the race has begun. 17/18 is going to be a war in which prisoners are not taken. No wild dreams though. No Messi, no Ronaldo. Mbappe? All the low tone talk seems to indicate that his heart is with us–Wenger had tea with him in his home–but where is his head? And what about those huge sums that are being linked to his value, some of them even coming from us? Do we dare dream? If I am given the smallest of chances I would snap up Alexandre Lacazette of Lyon and shift my bigger dreams to the future. Ditto the Argentine Paulo Dybala from Juventus; ditto Pierre-Emerick Aubameyang from Dortmund. 24 year old Mauro Icardi of Inter is prolific with goals and he would improve our team. Then there is this little rumour that Harry Kane’s pocket has grown too big for the tiny packet from the Spuds. He only needs a short walk to become a big boy. If there is one thing that is clear, it is that we desperately need a world class striker. Planes would be scrambled up in the sky on the first day of the season if there is no world class striker in our starting line up. The fans have waited long enough. But first we have to keep what we have and need to hold–Ozil, Sanchez, Bellerin, Chamberlain and company. Some people use the word stubborn to describe Arsene Wenger. I’ve never approved of that word. For me, Wenger is simply dogged in his convictions. If you ask me, I don’t want anything to do with anybody blown about by the wild wind. This time, Wenger’s stubbornness is allied with everyones’ wishes because he has reiterated that what he has, he holds–except, of course, if somebody comes with silly money. I ask, if some bloke comes with enough money to sign Messi, wouldn’t you deal? The referendum on Ozil/Sanch-exit is a resounding no from the fans and I can’t see what can trump it. It might be my wishful thinking, but what’s in the air–particularly on Sanchez–could be mere noises. Sead Kolasinac is in the bag and will battle it out with Monreal for the left back position. Monreal is probably the fittest player in our squad with none of the muscle problems others have suffered. He can double as a left back and central defender. He is also the quintessential professional, a beacon for others. Being on the wrong side of thirty is mere numbers to him and I hope he has many more years with us. Sadly, I cannot talk in the same breath of Gibbs. A nice fellow, but just an OK player which is no longer good enough if our desire is to move up the ladder. However, with Monreal covering as a central defender, we might want to hold onto Gibbs. Kolasinac, we hope, improves our team, so he is welcome. I particularly love the fact that he is something of a battering ram, something for which I thought Wenger had long lost his taste. Maybe because he came as a free transfer it became so much tastier to him. There is no doubting that the signing is doubly smart as it also leaves untouched the money in our coffers for a slug-fest with all comers for the aforementioned world class striker. Henry Onyekuru, I had thought, was all but in our bag too. But as the haze of the summer window thickens, doubts have crept in. Henry excites me, not because of his name, but because of his pace, his incredible ability to change direction and his lightening quick feet. There is something uncanny about his reaction time, as if everybody else is in slow motion. He is no Messi, but they are neighbors in the same time dimension! Give that lad to Wenger and in two years he could be unplayable. If we don’t get him now, next summer some smart fellow will have put a price tag on him that the silly money boys would be only too glad to pay. There are plenty of returns in that kid whichever way you want to look at it. One thing I don’t want to hear a year or two from now is Wenger saying that he nearly signed him. Watch my words. In central defence, we currently have Mertersacker, Koscienly, Mustafi, Gabriel, Chambers and Holding. Age and/or injuries should put a question mark on Per and Koscienly. Despite his chronic achilles problem, if properly managed, I expect Kos to give us a minimum of 25 Koscienly-esque games and that alone is mouth watering. As for Per, who did enough in less than 130 minutes to be dubbed the ‘player of the season,’ who would dare let him go? The 3-man central defence is made for him. A very cerebral player, he has a personality that players around him find very reassuring. Blessed with a firmness that is free of any harshness, he has given us a hint that a programme is on the cards that would slowly transform his role on the field to a role outside of it. Is he the Director of Football in the making that we all have been speculating about? Arsenal have done it before in ‘Arsene who?’ Are they going to do it again in ‘Per who?’ This just about leaves us with four central defenders we can fully count upon. Is this number enough for a 3 CB system? Maybe, as Nacho can be factored in as an extra cover. In PART 1 of this post, I drew attention to how Wenger repeatedly engineered the conversion of offensive players to more defensive roles but has never done it the other way round. The stage seems set, in my eyes, for that trend to experience its first reversal. 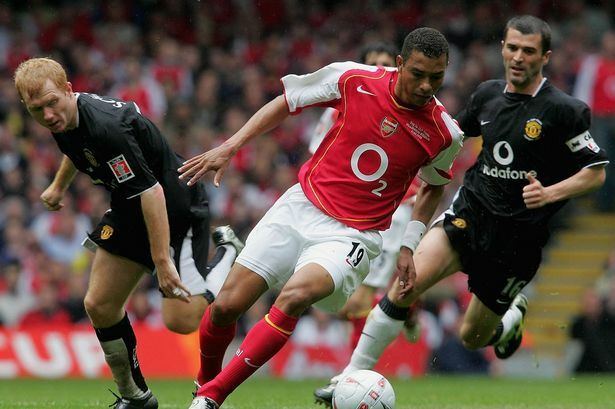 Also in PART 1, I indicated that the stand out feature of the Invincibles, relative to our teams of the post Invincible era, was the presence of two players in the central midfield–Vieira and Gilberto–who where both equally good in possession as well as without the ball. Ladies and gentlemen, Rob Holding is the candidate I propose for Wenger’s first ever conversion from a defensive role to a more attacking one. Holding in central midfield would be the resurrection of Gilberto. Dubbed the ‘invisible wall’, Gilberto was also excellent on the ball. It’s the same with Holding, a defender with incredible composure on the ball. He’s a dream defensive midfielder but will Wenger do it or would he prefer to find us a Vieira instead and, if so, who might that be? Maxime Gonalons of Lyon? A battler, but, in my opinion, not nearly there. Naby Keita of Leipzig? Terrific with the ball but not exactly an N’golo Kante without it. Kevin Strootman of Roma? He plays like Xhaka, but with a quicker turn. All of them are great players, but my pick for a place in the Arsenal central midfield is a 23 year old Brazilian international, Fabinho of Monaco. Excellent with and without the ball, Fabinho is Vieira Mark II. It is noteworthy that Fabinho was converted by Monaco’s manager, Leonardo Jardim, from right back to central midfield. Check him out please and tell us what you see. Wenger has hinted that there will be a maximum of three signings. I wish the operative word was ‘minimum’ because one signing is still within a maximum of three signings. Wenger is an old fox. If he actually means three signings, that would be wonderful–as long as they are world class players able to individually improve our team. The three signings should also come with a proviso–if we lose any world class player, we replace with another. I saw a certain glint in Stan Kroenke’s eyes as he watched our team slice through Chelsea at Wembley like a knife through butter. It was as if he was seeing for the first time that we actually can make a bid for the top. I figure Wenger must have seized the opportunity to place an ambitious plan on his table the very next day. Do we dare dream of sitting atop the rearranged sequence of top teams come the end of 17/18? I should think so. 30 Responses to Is Rob Holding the New Gilberto? another thought-provoking well written and edited post by PE. Cheers my man. For me Holding is CB material but I like your thinking. I think the 3 at the back is great for him at this stage of his career as he can learn on the job with plenty of support around him. I reckon the Xhaka-Rambo combo is the way forward and they benefit from the likes of Holding, Mustafi, Koz etc behind them. But maybe Wenger should try Holding out in midfield… why not? Oh and I don’t think we need a world class striker. We should play Alexis central and get another quality left midwinger. World class would be great, but one that can score and assist regularly would also be fine. In that first part (yesterday) you write a bit about Wenger and the way he wants his teams to play football. As such, and knowing how difficult it is for Arsenal to operate in the transfer market, I think he “knows best” when it comes to the building of a squad.. (No secret there, I love our manager…) So, speaking just for myself, I’d mostly leave it to the old fox.. :D.
Another brilliant post, PE. I like that you are not afraid to come up with such a revolutionary (okay, not so much as it’s not like converting positions is a new ideal; but you get my drift, right?). If the need for such a player arose, I am sure the manager will make the call. He’s always preferred some versatility in his players and may not be short of options in the likes of Holding, Mustafi or even Chambers. Holding isn’t the paciest but that’s not a requirement for the Gilberto role; Holding is good on the ball and does have the ability to glide through opposition, when he dares to carry the ball forward; he already has the requisite level of aggression for ensuring he isn’t dominated. So, for me, he won’t be such a bad choice. But only IF that role is a requirement of the side. “We have some young players who will join the squad next season,” Wenger told Arsenal Player. “Like Reiss Nelson, like Ainsley Maitland-Niles already. So they are two players. I will add Krystian Bielik and Christopher Willock to that list. Hey, 17HT, I read so too about Bielik but nothing official yet. I also read Willock is in the last year of his contract (not sure how true), thus leaving him open for another club to pounce. I like the look of that kid and hope we don’t let him leave just yet. Thanks guys for all the taughtful comments. There is no doubting that Xhaka and Rambo are a brilliant fit for the 3-man CD. But one thing about football is that every system has another system that is its antidote. So there is really no best system. A truly great team must be capable of being very adaptive, and the more of the universal (well rounded) players a team has, particularly in the midfield, the more the team is able to be spontaneously adaptive. Remember that there is no way Xhaka/Rambo pairing can do the 50 plus matches per season and that pairing is a vital cog in the current success of our 3:4:3. Allowances must be made ab initio for adapting with other pairings. IMO, Alexis hasn’t got the temperament for playing as a striker. In spite of the fact that he is a prolific goal scorer, that role frustrates him and he has the bad habit of taking out his frustrations on his mates. In fact this was one of the causes for our temporary collapse the season just ended. Nothing better than us getting a top class striker backed by the prolific goal scoring Sanchez. Sanchez’ s role must allow him to go to the ball. Again you rubbed off all the noises in my post. Great editing. Correcting Fabinho’s age from 22 to 23yrs is evidence of the amount of sweat you put into these edits. Am impressed and thanks. On Holding you made the comment that he is not the paciest guy in the sense that that disqualifies him for a DM role. I think the reverse. My only fears about him as a CD is his not being the paciest guy. Central midfield are more forgiven of poor pace which accounts for why Xhaka and Rambo are clicking nicely there. Holden is a well rounded player. A defende, good touch on the ball, good close control, good passing vision and technique, good in the air, versatile. The place to get the best out of a versatile player is in the midfield. Thanks. I find that am not afraid to be faithful to my visions of things. Isn’t that my only option? Am glad you have also seen in Rob Holden what I see. I like your caveat “But only IF that role is a requierement of the side”. It’s validity is on the premise that things remain constant, mark you. Before our 3:4:3 Wenger was being accused of inability at Plan B. Nine wins out of ten, there is already an inability in us to accomodate any thought other than 3:4:3 and Xhaka/Rambo in the CM. We must be ready before hand. Maybe I have too much of Pep in me. If the vision is clear and precise why wouldn’t one keep reinventing. However the real point am trying to make is that versatile players are the key to a spontaneous adaptability of a team to different systems. With a Gilberto and a Viera, a Plan B becomes in-built. PE, Rambo and Xhaka don’t need to play any other games than PL ones. That’s a strong point you made about Alexis. Balancing his assets with his liabilities decides where his best position is. PE, I have high hopes for your fellow countryman, Iwobi, on the left. But we cannot count on him yet. Welbeck is a good squad player to have and Giroud is a goal guarantee back up option. Theo I don’t want to see anymore, but I guess we won’t get rid of him. I love Perez but Wenger doesn’t, so….. who to add? You could argue we need a quality winger on the left AND right. That’s why I like the sound of Mahrez coming our way possibly. Hi all.. Hi PE.. great post.. Yes Holding is really special.. But with Sead Kolacinac we now have very solid defenders.. Mustafi can play as a RB isn’t he..?? And if all fit, Holding will get less time to play in PL.. but He still can play in League Cup and FA Cup..
Mbape.. why people always talk about him.. 100M for 19 yo.. crazy.. I don’t think Sanchez or Aquero is 100M man..
Our Nigerian Henry can also become one best striker if given time.. hehehe..
Youngster isnt easy thing to overcome.. How many youngster we want to promote without cutting off a lot of main pllayers..
Holding is one of the most successful youngster this season.. Bellerin and Iwobi a year before..
Next season, I wish JRA and AMN will do the same..
Iwobi is so good ferrying the ball upfield and he has that Rosicky thing of getting the people around him play better. Still he needs to develop better bite where it matters most, goals and the final passes. The CMF is where am hoping for a good addition. That area is so important for the way we play. Not wise anymore to put Santi into the MF plans. Xhaka and Rambo are tailor made for the 3-man defence only. Beyond then, nothing good enough. 4:2:3:1 and we are right back to where we were after Santi’s injury. We need a Coq there who can also use the ball well. Fabinho, Holden or any top well rounded player. Mustafi, I agree, wouldn’t be out of place at RB. He loves venturing forward and looks goal hungry. But we have Bell and Ox there and furthermore Musti has become the most available senior member of our back four (less Gabriel). So he stays as a CD. Really interesting series of post PonyEye. For me central midfield is one of the key areas, if not the key area, Arsenal need to address in the transfer window. Put simply, with the exception of maybe Xhaka, none of Arsenal’s central midfield options (Ramsey, Cazorla, Coquelin, Ox, Wilshere, Elneny) have proven over recent season that they have the necessary combination of ball recovery skills and the propensity to quickly transition the ball from defence to attack (either dribbling or long range passing) to fulfil the inherent requirements of the 2 central midfielders in a 3421 setup. Chelsea’s central midfield pair of Matic and Kante is a great indication of the profile of player that Arsenal should be looking to recruit in the transfer window. – None of Arsenal’s central midfield options have proven in recent seasons that they have the ball recovery skills to match Matic or Kante. For the above reasons I think Arsenal’s central midfield could and should be significantly reformed with new players bought who possess a skill profile more aligned with the inherent requirements of the position. – Retain Xhaka and hopefully he will improve his defensive contribution in his second season at the club. – Retain Cazorla but as a back up to Alexis and Ozil in the CAM positions. – Retain Ramsey but as a bench option in the CDM position to be brought on when Arsenal are chasing a goal late in the game. – Sell Coquelin as his transitional contribution is simply not good enough and he has had ample opportunity in the CDM role. – Sell Wilshere as his defensive contribution is simply not good enough and he has had ample opportunity in the CDM role. – Retain Ox on the basis that his forward dribbling skills are excellent and he hasn’t had enough opportunity in the CDM role to demonstrate whether or not he can contribute defensively to the required standard. – Sell Elneny as his contribution in terms of transitional play and ball recoveries isn’t good enough and he has had ample opportunity in the CDM role. – Loan Maitland-Niles to a club where he will pretty much be guaranteed game time in the CDM position to further his development. Wow Waldo.. You rock it..
It’s a very great statistic you got.. But we don’t need Chelsea style players cause We are Arsenal.. They lost twice, so nothing special.. hehehe.. But I agree with you with some name that will make us more solid.. Diego damme will be perfect.. another great RB and can also play DM.. but bring him first before we sell Elneny or Coq..
TA, would that be because we all have (first or last) names with an ‘E’? 😄😄. Speaking of which Alex Iwobi and his Nigerian national team mates inexplicably lost 0-2 to South Africa Saturday, giving the South Africans their first ever win over Nigeria in a competitive game. Couldn’t see the game but understand Iwobi was well shackled. One of the shock results in the AFCON this weekend. I had been wondering whether you’re a kind of ‘Doctor without boarders’. How you dey? I cannot even begin to entertain thoughts of letting Wilshire go. For so long he’s been our symbol and our dream. Yet I would not make plans based on him. I mourned the exit of Diaby. I am beginning to despair and fear that I will mourn again. Wow! The research! You love tactics. I love it too. Like you I feel we haven’t got quality depth in CM. Xhaka and Rambo pairing is perfect for 3-man defence system. Eln, Coq lacking sufficient offensive qualities for 3:4:3. Ox, great talent but not yet savvy enough to man the engine. Santi and Wilshire????? People never change much in life. Players never change much on the pitch. So you might be disappointed hoping that Xhaka would improve his tackling. Important thing is that he is effective with a 3-man defence system. As for passing accuracy, I really don’t read too much into to that stat as often CDMs make repeated short passes backwards and sideways which invariably improves their passing accuracy but doesn’t really indicate whether they are effective at transitioning the ball forward. Denilson was a good example of that. – recruit and deploy players in particular positions were the player’s skill profile closely aligned with the KPIs for the role in which they were deployed. Those sides’ predominant central midfielder pairings of Matic and Kante and Wanyama and Dembele were both great examples of that. It’s something which I think Arsenal can learn from particularly when it comes to what Arsenal expect of its central midfielders and the club’s recruitment practices. While Arsenal were able to beat Chelsea in the FA Cup final (which was a glorious day!!) ultimately it was a one off match. Over the course of a 38 match Premier League campaign, I have serious doubts as to whether Arsenal can deliver the consistency of performances required of mount a genuine title challenge without the role of individual positions within the 3-4-2-1 being simplified and the club’s recruitment practices placing a greater focus on alignment between the skill profile of prospective players and the KPIs for the respective role the player is being recruited to perform. That said, these are not insurmountable issues and with a club of Arsenal’s financial resources, could be resolved reasonably quickly.